Julien's Auctions, the world's premier Street Art auction house, announces the October 22nd biannual Street Art and Contemporary Art live auction featuring the naked Donald Trump statue entitled "The Emperor Has No Balls" (Estimate: $10,000-20,000) by anonymous art collective INDECLINE which appeared on the 4600 block of Hollywood Boulevard. A portion of the proceeds from the sale will benefit the National Immigration Forum, one of the leading immigrant advocacy organizations in the country, with a mission to advocate for the value of immigrants and immigration to the nation. This auction includes other coveted works by Street and Contemporary artists including Banksy, Keith Haring, Jean Michelle Basquiat, Andy Warhol and Shepard Fairey. "Naked Trump" is one of a series that recently caused a commotion nationwide recently when appearing unannounced in public spaces in New York, San Francisco, Seattle, Cleveland and Los Angeles. This "Naked Trump" was rescued by La Luz de Jesus Gallery director Matt Kennedy, and is one of the only remaining examples not confiscated or destroyed. The explicit statue quickly became a symbol of political protest art and garnered international coverage when the gallery refused to hide or censor the statue, choosing instead to display it prominently and in public view. The "Naked Trump" statue was loaned to the Jimmy Kimmel Live! Show, and found its way into the opening monologues of Jimmy Fallon's Tonight Show, Stephen Colbert's Late Show, and hundreds of other news and entertainment outlets. "Naked Trump" will be on public exhibition at the Julien's Auctions Los Angeles gallery from October 17th through October 22nd, ahead of the Presidential election in November 2016. To celebrate the political, alongside "Naked Trump," Julien's Auctions will also be offering Knowledge Bennett's "Hillary Clinton Cojones" (Estimate: $10,000-$15,000) featuring an image of a "ball grabbing" tux-wearing Clinton, and Shepard Fairey's "Hope" (Estimate: $3,000-$5,000) with the iconic image of Obama that led his 2008 campaign. 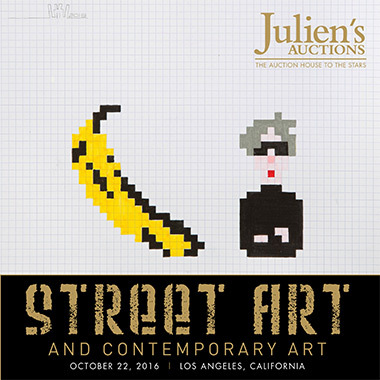 Julien's Auctions' October 22nd Street Art and Contemporary Art auction also features artworks by controversial street artist Banksy, including "VIP Rat" (Estimate: $30,000-50,000) as well as original works by other highly-sought-after artists including Keith Haring's "Radiant Baby with AIDS Alligator" (Estimate: $10,000-15,000) originally created on a New York City Bowery subway station sign circa 1984, and an original street piece by Jean-Michel Basquiat under his pseudonym SAMO titled "Samo As A Neo Art Form" (Estimate: $40,000-60,000) created in wet cement on the New York City streets. The auction will feature the important collection of over 150 editions, multiples and paintings from the avant-garde Canadian designer Andrew Bockner. The Collection of Andrew Bockner features important prints such as Banksy's "Choose Your Weapons" (Estimate: $25,000-$35,000), "Pulp Fiction" (Estimate: $10,000-$12,000), and "Bomb Love" (Estimate: $10,000-$12,000) in addition to monumental prints spanning from the Post-Modern, Contemporary, Street and Urban art movements highlighted by Andy Warhol's "Edward Kennedy" (Estimate: $10,000-$15,000) and names including Roy Lichtenstein, Robert Rauschenberg, Alexander Calder, Keith Haring, Tom Wesselman, Mel Ramos, Space Invader, KAWS, Jose Parra, and Sandra Chevrier to name a few. Julien's Auctions will also host a curated evening auction with Toowee Kao, Director of the landmark Los Angeles gallery Soze and Art Advisory LA. This marks the first time Julien's Auctions has collaborated with a collector as a curator. Kao's passion for Contemporary artists has shaped the Los Angeles urban art scene. Included in this sale are Kao's picks which are highlighted by an oil on canvas by female revolutionary Miss Van titled "Black Mask Dancing Hair" (Estimate: $15,000-$20,000) and a painted collaboration between Cleon Patterson and Modernica (Estimate: $3,000-$5,000) in addition to work by Retna, Hebru Brantley, Jaybo Monk and Zio Zegler and more. A portion of the proceeds will benefit KAO's nonprofit art camp for inner city children in the downtown area of Los Angeles. Historic dress worn by Marilyn Monroe when she sang Happy Birthday to You to president Kennedy. 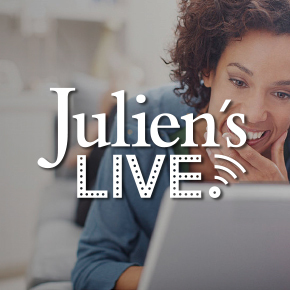 Can't make it to the auction, then watch live streaming with Julien's Live.